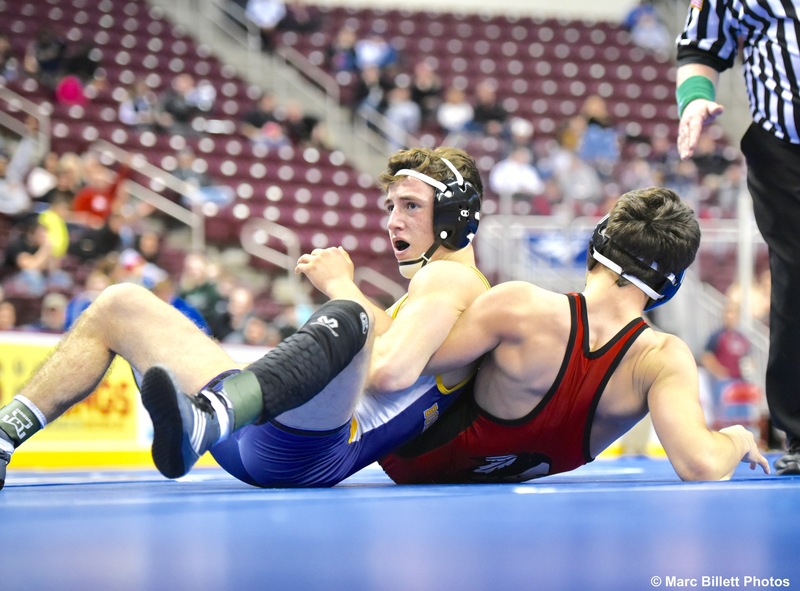 HERSHEY: Boiling Springs’ Kollin Myers knew he needed more work when he was told he was bumping up to 145 pounds in the postseason. In other words, the true 138- pounder had to eat. Not only that, he had to go like crazy in the practice room to balance out his weight and still be able to maintain strength for dealing with opponents in a higher weight class. Myers needed every bit of his ability and strength in Saturday’s District 3 Class 2A Championship final against Pequea Valley’s Gabe Miller, who also bumped up a class this postseason. In one of the more entertaining bouts of the day, Myers and Miller put on a scrambling clinic for 85 percent of the six-minute match. When the buzzer sounded, Myers made more big moves and earned a gutsy 8-4 decision and the title. “Six minutes of a match in a scramble, it’s crazy,” said Myers, who is ranked second in the state, according to PA Power Wrestling. “I knew coming into the match it was going to be like that. Myers won more than he lost. The Bubblers junior scored on an early takedown and was up 2-1 with time winding down in the first. Surprise, surprise, there was a scramble and with a little less than 15 seconds left, Myers landed a Peterson to add to his total. There appeared to be back points, but none were awarded. Bubblers head coach Rod Wright was livid on the bench between periods, which delayed action. “The way I wrestle, I just feel my situation,” Myers said. “If it’s there, I go for it. It was there, and I just took it. It worked. Miller, ranked third in the state, escaped in the second to make it 4-2. The two wrestlers took turns bailing out of precarious spots and, somehow, managed to keep the score the same entering the final two minutes. It wasn’t a definitive finish for the Bubblers ace, but it was good enough. He escaped and managed another takedown off a scramble to go up 7-2. Miller reversed in short order and was looking to turn the exhausted Myers before finally cutting him for the final outcome. “In a match like that, you can’t stop,” Myers said. “Every time you step off the mat, you should be completely dead from the energy exerted. You should really feel like crap, to be honest.